After a significant move to the upside to start 2014, I believe the AUD/USD is setting up for further upside. We’ve been in a sideways trading range for two months now between .92-.94 leaving people to ask: where to next? I believe that despite last week’s weakness this is not just a lower high setting up for another leg lower like we saw in the third and fourth quarters of 2014, but instead a pause in an otherwise orderly bottoming pattern. The first chart we are going to look at is a weekly bar chart going back to the ’09 low. As we can see there is significant support around the .865-875 area which was confirmed by multiple tests in 2009 and 2010. In addition, the false breakdown below that level provided additional momentum for an aggressive move to the upside that ignited a rally in May of 2010. 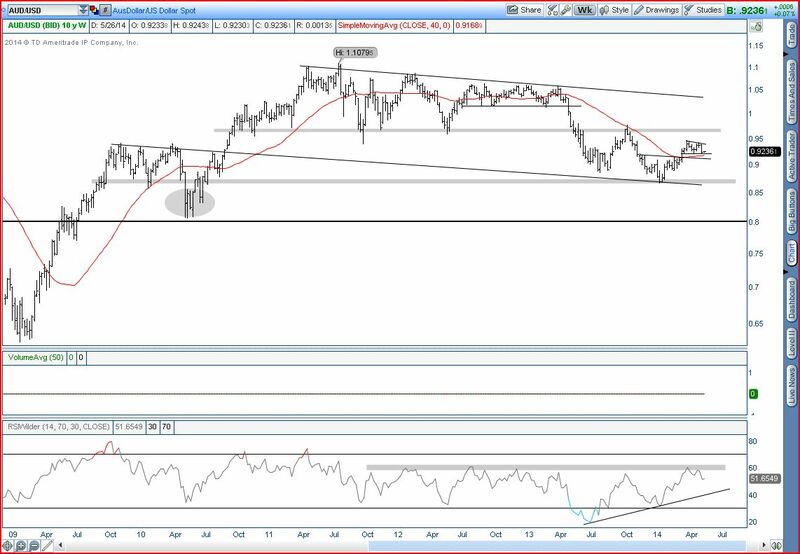 After breaking down from the multi-year sideways range, we recently retested this support level with a positive momentum divergence indicated by the higher low in RSI and lower low in price. These positive divergences have helped price form and confirm an inverse H+S pattern to the upside. In addition, the forty week moving average has flattened and is now rising slightly which may provide some support to price. Another day of upside for small caps and technology while the Dow and S&P 500 were flat to slightly higher on the day. The VIX put in an inside day after filling the gap lower yesterday. Support continues to hold in the high 11s but we’ll likely need to see some basing before any meaningful move above the falling moving averages that are resistance above. Bonds (TLT) put in a bear engulfing candle and filling one of the gaps lower but held the prior high in the mid 112s and remains above rising moving averages. Global equity markets were mixed on the day with RSX, VNM, EPI leading to the upside and GRK, EWZ lead to the downside. Bias in the US indices is neutral/higher as we are above key moving averages except in the Russell 2000 but the action definitely remains choppy, not giving any clear direction. Leaders to the upside included regional banks (KRE), large cap biotech (IBB), telecom (XTL), small caps (IWM), social stocks (SOCL), semiconductors (SMH), the transports (IYT), and oil services (OIH,PXJ). Laggards on the day included utilities (XLU), coal stocks (KOL), reits (IYR), consumer staples (XLP), gold miners (GDX), steel stocks (SLX), homebuilders (XHB), and solar stocks (TAN). The major indices closed positive on the day near the highs after some overnight and early session weakness. Today the Russell 2000 and Nasdaq lead to the upside while the large cap indices held the 30 day SMA and put in a small hammer candle. Volume remains average to slightly below average despite the false breakout in the large cap indices increasing volatility in the Russell 2000 as it tries to hold the YTD lows. The VIX and put call ratios remain low signaling complacency continues. Global equity markets were broadly higher on the day with India up 4.5% or 6% depending on the ETF (INDA, EPI) and Greece (GREK) being the loser on the day down 2.85%. Bonds (TLT) were down slightly on the day on light volume after getting extended on the daily chart. The bias remains to the upside above rising 10/30 day SMAs. Leaders to the upside included retail stocks (XRT), semiconductors (SOXX), homebuilders (XHB), telecom & telecom services (VOX, XTL), transports (IYT), consumer discretionary (XLY), Reits (IYR), and coal stocks (KOL). Laggards included solar stocks (TAN), gold miners (GDX), energy stocks (XLE), social stocks (SOCL), aerospace & defense stocks (PPA), large cap biotech (IBB), and regional banks (KRE). Today the major indices experienced a third day of downside but closed well off the lows, with small caps putting in a large bottoming tail after testing support in the mid 107s. Volume was slightly above average and the VIX confirmed an upside island reversal and closed up 8% on the day. Bias for the major indices remains neutral/lower after a false breakout in the large cap indices and continued weakness in the Russell 2000. We’ll have to see if today’s bottoming tails results in any upside follow through tomorrow that allows us to move through today’s highs and fill the gap lower. Global equity markets were largely lower on the day with Greece (GREK) closing -4.5% and TUR, EZA, VNM, EWI, EWP, all closing with 2% or higher losses. Bonds (TLT) gapped higher for a third day in a row but put in a shooting star candle after hitting resistance in the mid 114s but needs confirmation to the downside tomorrow. Leaders to the upside, or in today’s case things that held up decently well, included reits (IYR), social media stocks (SOCL), utilities (XLU), regional banks (KRE), and transports (IYT). Leaders to the downside included solar stocks (TAN), oil services and energy (OIH, PXJ, XLE), gold miners (GDX), basic materials (XLB), aerospace & defense stocks (PPA), retail (XRT), semiconductors (SMH) , and coal stocks (KOL). Today the major indices followed through to the downside after putting in a topping tail yesterday. Small caps continue to lead to the downside after being rejected at the 30 day SMA while the other major indices are above their rising 10/30 day SMAs. Volume continues to be light and the weakness in small caps continues to show that the market is likely to continue its choppy action. Bonds (TLT) made a new closing high after a nice 3 day move off its 30 day SMA and the bias remains higher until we break those rising moving averages. Global equity markets were mixed on the day with Vietnam (VNM) leading higher and Ireland (EIRL) leading to the downside closing 1.8% on the day. Leaders to the upside included gold miners (GDX), utilities (XLU), social stocks (SOCL), coal stocks (KOL), large cap biotech (IBB), and reits (IYR). Laggards included regional banks (KRE), homebuilders (XHB), small caps (IWM), retail (XRT), aerospace & defense stocks (PPA), consumer discretionary (XLY), telecom (XTL), and transports (IYT).